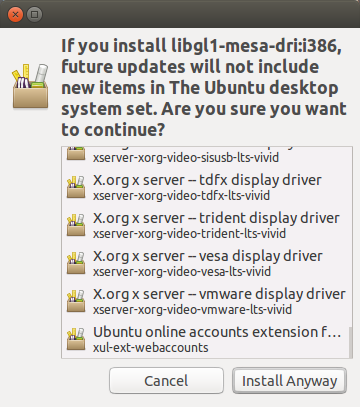 Just got my new computer and installed 14.04.03.
after entering password I get the following"
I am using the new graphic driver ppa https://launchpad.net/~graphics-drivers/+archive/ubuntu/ppa so could the libs from there be causing this? Update #2 Steam will now launch but will still pop up the terminal window wanting to install the three libs above. If you close the window Steam will launch and appears to be working normally. I was able to restore my games and launched one so far. 1st some background: I initially installed Steam with the Software Center's "Reinstall previous purchases function. This installed steam-launcher Which as the answer above states cannot be found by Synaptic. This is because Synaptic only finds programs that are already in the repos but Steam launcher is in it own ppa. The Software Center can see "for purchase" applications, which is what Steam initially was released as. "For purchase" here does not necessarily mean that you have to spend money, what this function does is allow you to install apps that are only available in their own ppa. Installing this was add the ppa as well as the program. For some reason installing in the above manner does not pull in the libs from the vivid stack only the original trusty repos and the trusty-updates repos. This causes the conflicts and the dependency errors that I posted in my question. Installing per this answer corrects this issue and pulls from vivid. There appear to be several ways to get the steam:i386 one is using Synaptic. The other graphical way is the Software Center but you have to click on the bottom left of the window to "Show [a number of] technical items" In my tests this also brings up the steam:i386 option. That last way is using the terminal and typing sudo apt-get install steam:i386 (note that here for some reason using the Tab button to auto-complete doesn't work here you have to type the whole steam:i386 out. Using the terminal to do a simulation I saw that it would install the libs from the vivid repos and that I got no errors. I went ahead and installed. If you check via Synaptic you will see that it pulls in a newer version of Steam than steam-launcher installs, it also installs slightly differently. These differences lead to the quirks I mentioned above. Steam now installs in .steam where as .steam used to just be a link to where the actual Steam install was. To wit: .local/share/steam This is the cause of the quirks that I will list below. Steam will not find that apps that are in the old location and will want to re-download them all. If are doing a drag and drop an old folder of the steam apps that you saved previously they need to go in .steam/steam/steamapps/common (note that steamapps is no longer capitalized). The appmanifest files will still go in the steamapps folder but do not copy the libraryfolders.vdf as that info will have changed to a new location. If you did not save the appminifest files, it's little matter; Steam will just think the games are not installed but if you have placed the steamapps file in the proper location, you can just click the "install" button in Steam, Steam will start the install and then discover the existing files and have to validate them. This will still work fine but will take some extra time as you have to do this for each game. If, like me, you have tried to install Steam via the "Reinstall previous purchases" function before installing Steam as detailed above, you should remove the old Steam repos to avoid conflicts. Just open "Software and Updates" from the dash then go to the "other Software" tab, click on the "installed by the software center...steam repo" selection and hit the "Remove" button. When you close the window allow the "Refresh" in the prompt and then you can go about the install. It would appear the installing this way only install Steam locally, whereas the steam-launcher was installed system-wide. This is really only a question of semantics, as steam-launcher didn't really install anything but a link that would activate an option for all users to install Steam. The .desktop file is installed system wide so other users only need to click the icon to install. In either case Steam itself only installed to the local users files and had to be reinstalled for each user. There is a way to link to the game files for each user so that they can share the actual games and not have to reinstall the same game numerous times but as I never needed to do that, that is beyond my experience. It looks like you can get the correct version of steam by just installing steam via apt-get, at least after I used steam:i386 sudo apt-get install steam will tell you that "steam:i386 is already the newest verison" Just using steam will allow auto-complete to work but as I was unsure it was the correct package during my test, I did not chance it. Lastly, this worked flawlessly for me, however in my attempt to fix this I added 1386 architecture via sudo dpkg --add-architecture i386 so if you get errors that steam:i386 cannot be found you may need to do this, but I don't think you will. One of the dependencies of steam:i386 is multiarch-support which appears to be preinstalled by default so that should make adding i386 architecture superfluous. I moved the steamapps folder out of the Steam install so that it would not be overwritten, then sudo apt-get remove steam:i386 Then moved the steamapps folder into .local/share/steam answered yes to allow the folders to be overwritten and when started Steam logged me in and the games launched without a hitch. I'm nearly certain that I had tried the package directly from Steam's website when trying to install before and got the same errors. Installing steam:i386 pulled in the dependencies correctly, and worked fine and I could have left it as was but it bugged me that it seemed "hackey". So you could either install steam:i386 and have it work without fuss, or can remove steam:i386 afterwards and install the package directly from Steam and have the directories were they were previously(and most users expect them to be, this could make it easier to get help form the community in the future). This answer is left for historical/informational purposes or in case the accepted answer does not work for you. Please try the accepted answer instead!!! I found the most reliable answer on an old steam bug report from 2013. Reading the thread it became clear that Steam does not do well with HWE releases and tries to pull the libs from the non HWE repository and this causes the conflict. If you tried to install you got the errors I posted above, but if you just closed the window Steam would launch normally. The bug report I referenced earlier contained some recent comments that lead me to the answer the relevant comments start here. One thing of note, this fix did not remove a single file, program or lib from my system(you might want to test with the sudo apt-get install -s(the -s switch here means simulation) then check the output on you terminal to make sure it will not on yours). Not the answer you're looking for? Browse other questions tagged nvidia steam or ask your own question. I'm having trouble starting Steam, could someone help? Can I access my broken machine data in any way possible?